I have been a longtime Everlane lover. Ever since my first my first experience (which had its pros and cons, you can read about it here), I have added several pieces to my wardrobe (this is my absolute favorite to-date though it looks like it’s no longer available in black) and have convinced my husband to do the same. Today the brand debuted Everlane Mini, a micro collection of their signature basics made in petite sizes. They are starting it off small – only 11 styles – and carefully edited, as all their lines are. 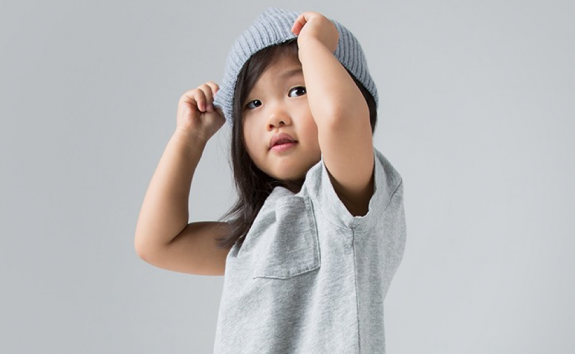 I am loving this cashmere hoodie (though admittedly, not sure my kids would love the cashmere as much as I do), these cool beanies, these perfect pocket tees and these crew sweatshirts. Overall, it’s a nice new option for minimally minded parents like us who want to skip the sequins and sugar-coated character tees whenever our kids will let us. And, as always, made in America with sustainability and conscious consumerism in mind…which is another nice lesson to wrap up for your kids under the tree this year. Love the collection, but really only the tees, which I stocked up on for C. And I hope they move on to bigger sizes. But I really have a hard time with the cashmere for little ones. Sorry, maybe it’s just me, but I don’t see buying cashmere for a 2 year old as practical. I’ve told them as such. I’ll just buy up all the tees and non-cashmere hoodies. 😉 Not sure who their target audience is because many of the comments on their IG are from people saying,”need to have kids now”. Couple that with a staff that skews under 30 and I’ll bet they think they’re great gift ideas for their nieces and nephews.